We have the desire to share with you our perspective on the way that you interpret reality. Keep in mind that this is just our perspective, and it is our perspective on how we perceive you interpreting your reality. So is it a Truth then, with a capital “T”? Probably not, but if it resonates, if it makes sense to you, then you might benefit from hearing our perspective on the way you interpret reality. First of all, we see you interpreting reality as solid and fixed. It is what it is, you sometimes say. When you take that approach to reality, you become powerless in the face of it. We also see that you look at the present as though it is the product of the past. You see continuity, and that often gives you comfort. We also see you projecting into the future more of what you see in the present. You make projections based upon the data that you have in front of you, and you extrapolate it out. So if things are going badly, they will get worse. That is the assumption. Here is what we invite you to do instead of maintaining your interpretation of reality. We suggest that you see your waking life as being no different than your dream life. In the realm of your dreams, things can change right in front of you. In the realm of your dreams, there is very little continuity, and it is often impossible for you to predict what is going to happen next, or what you will dream about next, based upon the current experience you are having of your dream. It behooves you to bring that same experience of reality to your waking life. 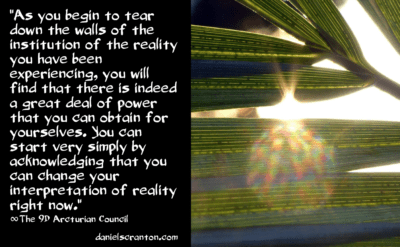 As you begin to tear down the walls of the institution of the reality you have been experiencing, you will find that there is indeed a great deal of power that you can obtain for yourselves. You can start very simply by acknowledging that you can change your interpretation of reality right now. Whatever it is that you are experiencing right now is not something that is unchangeable, and there is not just one interpretation of it. Shift your perspective, and shift your experience of reality, and then see what shifts next.